You are going to like this recipe! A moist chocolate brownie, with a fudgey caramel layer, studded with pecans and topped with gooey toffee sauce. Need I say more? I got this recipe from a nifty little book called 101 Chocolate Treats. A tiny, wee book from those lovely people at the Good Food Magazine. I have added cup measures for ease of use. Preheat oven to 180c/gas 4/fan oven 160c. Line a brownie pan with greaseproof paper (I use my round cake tin inserts, they fit when pushed into the corners). Melt the toffees with the cream. Lightly beat the eggs with the vanilla, stir into the melted chocolate with the sugar. Sieve in the flour and the baking powder, mixing lightly. Stir in the pecans. 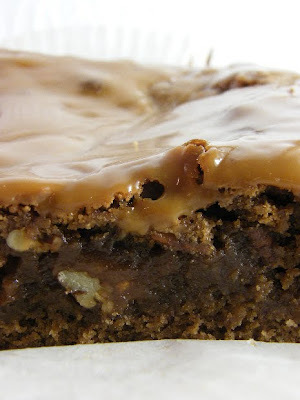 Pour half the mixture into the brownie pan and drizzle over ¾ of the toffee sauce. Spread over the rest of the brownie mixture. Bake for 40-45 minutes until firm to the touch. Leave to cool. Reheat the remaining sauce and spread over the brownie cake before cutting into squares. 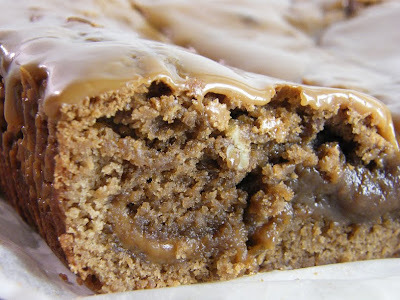 oh this looks so indulgent and delicious - it is high on my to do list (except it needs to wait til I can justify the calories) - are you baking with baby or is this from pre-baby days? Oh you would Sarah, it is lush! My mum nearly burnt her finger waiting to lick some of the leftovers from the pan. Some things are worth burnt fingers! These look absolutely divine. They are Sylvie, they definitely are! OH MY! wow, those look great! I was about to fuss at you for baking while you must be exhausted with baby. But then I read your comment. So, I'm just going to thank you for posting something so wonderful!!! Brownies and toffee my two favorite things. divine indeed. 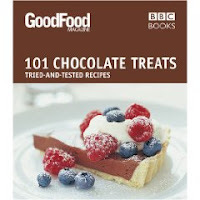 The BBC Good Food books are ace - I have '101 Make Ahead recipes' and you've reminded me to dig it out again! Caramel and chocolate these are like a Caramilk Bar...a whole pan of Caramilk.....sigh. These look like heaven in one bite!! I've recently discovered my ultimate love for pecans!! I have to try these, Yum! You had to post this when we've all just started our diets, didn't you? Oooh ooh my first response on seeing the picture alone was mmm ooh mm must make now! Will be getting some more pecans and trying these very soon, can't imagine anything more heavenly to eat! Yum! I have studied the recipe in my copy of this book and have always wanted to try it but never seem to have a good enough excuse for all those calories ... maybe I should just take the hit on the hips cause your photo's have me licking the screen! Hi Pam, I did mean to make brownies today, but haven't got around to it yet. In-laws are arriving tonight, so I did make soup. It's a super little book Katie, there are a few other dishes I am keen to try. Hi Nic, yes all cozied up. Graham is changing Cooper's nappy as we speak! Hi Val, caramilk bar, mmmmm, that does sound good! I just know you will enjoy it Anne and get brownie points for making it, har har! Go on Chele, give in to temptation, you know you want to! nope, you don't have to twist my arm to convince me that i'd love these. toffee rules, and the gooey decadence of these brownies can't be denied! I liked it before I even read the recipe. The photo did me in. Gooey, crunchy on the outside and is anything in the world better than toffee? You should NOT be tempting me! Oh my goodness, I was going to say how fab these brownies look but there is a baby pic on your blog! Cooper is adorable, he'll be very handsome when he grows up I'm sure, and having New Year's Eve as your birthday will ensure a lifetime of fabulous parties! Congratuations and lots of love to you all! Hi Alex, we are going to stick with that story as he gets older too. Do you think it will work? Hi Pierre, it is a perfect time to dream of summer holidays, as long as you don't look out of the window! I have this book but must have missed this recipe! These Toffee Pecan Brownies look absolutely divine. Hi Jacqueline, I've tried this recipe and my husband LOVE it... do you mind if I copy paste the recipe onto my blog and your link as well. Thanks.